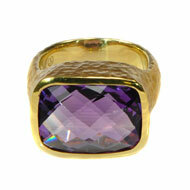 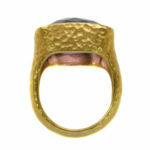 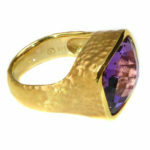 14kt yellow gold ring featuring a hand applied hammer finish with a bezel mounted natural Amethyst gemstone. 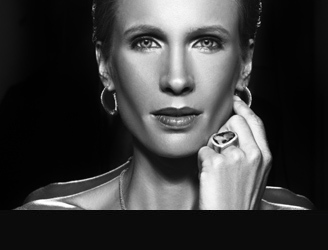 The Amethyst, which weighs 10.72ct, exhibits a checkerboard faceting that makes it quite unique. This is a custom design by Jorge Adeler.